My father taught at Maryville College in Maryville, Tennessee. 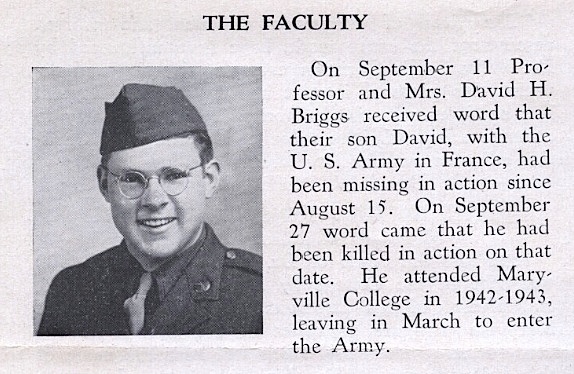 David Briggs, Jr. was his oldest son, my brother. My brother was seventeen years old and many of his friends were already eighteen and heading for the army to fight in World War Two. Seventeen-year-olds were not required to join the army, but could do so if they volunteered. My brother volunteered. He finished his training in time to join the massing armies in Ireland and Great Britain, preparing for the Normandy Invasion.